Along with Prof. Zhen Lei of Penn State, I have previously blogged about the late autumn surge in patent filings in China, in 2012, as well as in prior years. This autumnal hook likely arises in response to subsidies, quotas or other support that must be exhausted before year end. Why has there been such a sudden uptake in year-end administrative enforcement? One explanation is an end of year rush to accept or resolve cases to show increased efficiency and impact. On the converse side, the data also shows a significant drop in activity around holiday seasons, especially spring festival in January/February. These factors may apply across the board to many forms of Chinese government activity. Looking to policy factors, on June 28, 2011, SIPO announced a special campaign involving patent administrative patent enforcement. However, the campaign did not immediately result in a significant uptake in administrative actions. What may be more significant is the August 2012 publication by SIPO of proposed patent law amendments, which provide for an expansion for administrative enforcement and greater involvement by SIPO with IPR as an instrument for “market order”. These new policies may have precipitated a major uptake in administrative patent enforcement actions, on the assumption that “if you enforce it, they will legislate it”. In fact, October 2012 was one period of high rapid increase – with enforcement actions increasing 112% from September 2012, followed by a drop in November 2012. 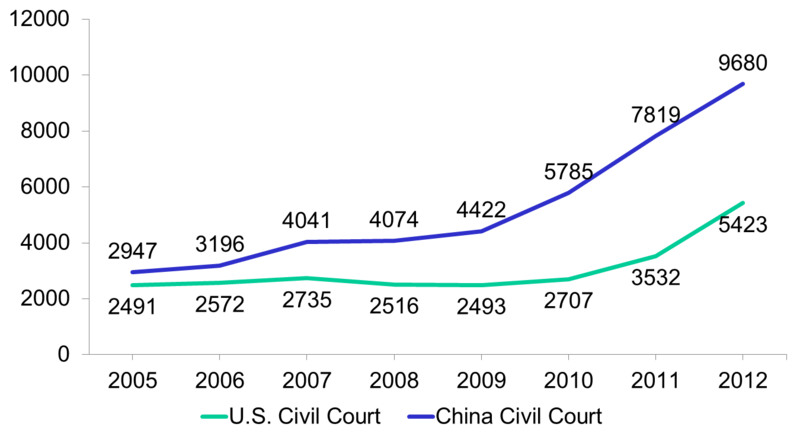 The rapid increase in patent “passing off” (counterfeit patent) cases similarly may also be timed with the patent law amendments. The amendments contemplate an increased role for SIPO in policing “market order”. Since such cases may be initiated by self -initiated by parties other than the infringer, they may also be more responsive to policy changes by SIPO. Local governments, such as Guangzhou, may also offer rewards for reporting these activities. Moreover, the change in the mix of administrative enforcement actions is striking. 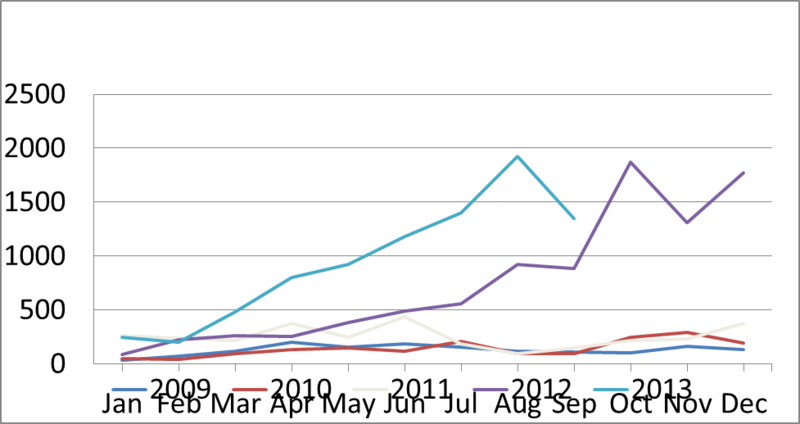 From 2006 to 2011 infringement cases dominated. Now patent passing off cases are approximately twice infringement cases. There may be other factors contributing to this rapid increase, such as enhanced authority of local enforcement agencies. In addition newly empowered agencies may now be engaged in rent-seeking behavior, such as by seeking revenue from filing fees. Indeed, Premier Li Keqiang identified excessive fee taking as a potential issue in IP administrative enforcement (http://www.gov.cn/ldhd/2013-11/20/content_2531230.htm). One comparison that does not appear highly relevant is with overseas trends. An influential article by Zhao Meisheng of SIPO Management Division Enforcement Administration Department “An Analysis on the Trend and Reasons That US Government Agencies Strengthen Intellectual Property Rights Enforcement” ( 试析美国政府机构加强知识产权执法的态势与原因 – 赵梅生 （国家知识产权局管理司执法管理处）电子知识产权 (Electronics Intellectual Property) (2013, 4) suggested that administrative patent enforcement is on the increase globally, including the United States. 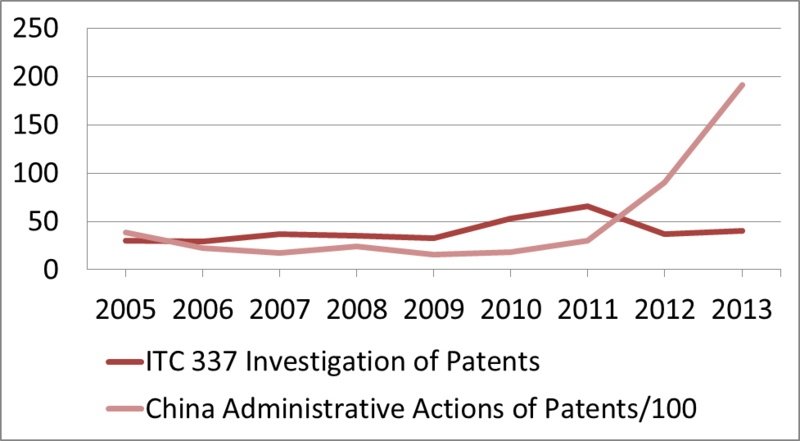 Comparing “civil” or “administrative” actions in one country to another is often an “apples to oranges” type comparison, nonetheless, “Section 337” actions in the United States, which involve US administrative procedures, are only a very small fraction of Chinese patent administrative enforcement actions, and have been relatively constant over the past several years. The growth in administrative litigation does not seem to be linked either with Chinese domestic IP litigation, which has shown steady growth over the past several years. (The preceding was adapted from a presentation I gave at the recent Asia Pacific IP Forum sponsored by Renmin University in Suzhou. The opinions in this blog are my own).